The recent Imperial Guard rumours have certainly been interesting with regards to the firepower the new Imperial Guard tanks possess. Notably the Leman Russ variants, which include the Leman Russ Executioner which fires 3 plasma cannon shots, while the Leman Russ Punisher's gatling punisher cannon fires 20 shots at range 24" with a strength of 5. Does anyone else feel that 20 shots is rather excessive? Well, you may not have so much reason to fear this new tank. So feel free to leave your troops within 30" of this tank and I'll explain why. That's 20 shots, hitting on 4+ to produce 10 hits and then wounding (lets say space marines) on 3+, which inflicts 6 wounds, 4 passed 3+ power armour saves = 2 dead space marines. Okay, perhaps its not so bad? Or it just highlights the sheer futility of firepower in 5th edition 40K, especially when you consider it could kill (on average) 2 marines or 6 orks. 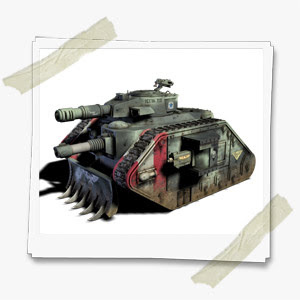 It's good to see that the Imperial Guard are getting some new toys after all these years, but none of the new and shiny specimens seem to beat the old Imperial Guard favourites like the Leman Russ, Leman Russ Demolisher and the Hellhound. But I suppose they had to give the Imperial Guard something extra now that the Basilisk has become rather obselete thanks to the True Line of Sight rules that feature so heavily in 5th edition. The plastic Valkyrie is a truly lovely model. I got to see some of these at the Games Workshop Open Day up in Warhammer World. They were nothing short of breathtaking and I can see a lot of Imperial Guard players getting ready to spend their hard earned monies on the rumoured plastic storm troopers (still haven't seen images of these yet), all riding in Valkyries. No doubt some clever minded persons will install some small speakers and an ipod to play Flight of the Valkyrie as the army swoops in low over the ocean and destroys an Ork village. I had an interesting discussion recently on Bell of Lost Souls regarding Imperial Guard and the Tau. Tau became kings of the firepower throne through combining elements of Space Marines, Imperial Guard and Eldar, so when I said I was upset to see the Tau losing their top seat, other posters were quick to remind me that the Tau Empire had been shoe horned into the game and into the fluff in order for Games Workshop to break into the Japanese hobbies market. So upon reflection, will the Tau lose out to the Imperial Guard in the fight for firepower? Probably not if the Punisher can only produce the same number of shots as 20 fire warriors, but without the benefit of marker lights. Neil from Flame On fame has often lectured me about the value of marker lights for the Tau in 5th edition 40K. After my recent escapades using the Sky Ray and with some Pathfinder models on the way, unleashing an overdose of firepower that hits on 2+ (thanks to 2 markerlights) makes a devastating difference when it comes to killing your targets. But it seems that Imperial Guard are the least of my worries in the long term, Due to suffering against armies that benefit from the Outflank rules, my Tau are really not looking forward to facing the new Dark Eldar. We were treated to some new Dark Eldar artwork in the 5th edition rule book, portraying the Dark Eldar as similar to the Craftworld Eldar, but with more sweeping spikes similar to the Dark Eldar glyphs instead of the 'chaos eldar' look they sported before. I'll confess that I'm quite excited to see the revamp of Dark Eldar, although one play tester warned me that their rules are quite disgusting and suggested that the entire army could come on from the sides of the table (this was in early 2008, long before 5th edition) and that they would retain their 'always get the first turn of the game' rule. So I think we can expect to see the same fast and fragile approach to the army, provided they don't pounch on you from the flanks and start gnawing on your entrails. In the last edition, a Dark Eldar Raider with Nets could zoom 24", then disembark its troops who could then Fleet of Foot and charge for a total move of up to 34". If Raiders are crusing on from the sides, sitting slap bang in the middle of the board won't save you, unless you've formed a conga-gun-line. Shadow Fields for vehicles are also set to make a return, allowing Dark Eldar to play the long range game by adding a handful of inches required to get your guns into range. 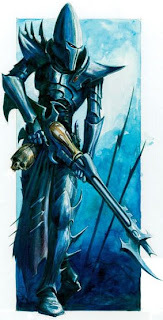 As before, I expect Dark Eldar to be an army for the tourney goers who have the competitive mind to min/max terrorfexes, destructors and other tasty Dark Eldar weaponry while newcomers to the hobby will struggle. But for veterans of fluff and tenacious young newcomers, the Space Wolves will be back soon! Great news for all gamers really. I've never met anyone who didn't love the Space Wolves for their character. While they might be a bunch of drunken, hairy heroes in power armour with pet wolves, they have long deserved a new codex. While nothing has been leaked yet, the Space Wolves will probably continue to follow the trends of their previous codex books with a focus on close quarters fighting and drop pod tactics. Whether or not they get all the new Space Marine toys remains to be seen. They're quite eccentric in nature, so I can see them turning their backs on a lot of this 'new confangled technology' in favour of a big battle axe and a beer. For anyone following the Horus Heresy books, 'Prospero Burns' has a fantastic image of Leman Russ and the pre-heresy Space Wolves on the front cover. Plus it's written by Dan Abnett. I'm buying it -that's for certain! That's all from me for now. It's back to painting those blasted Forgeworld Broadsides. Nice write up. I can honestly say I hate the current DE model range, but if they are re released looking anything like the pic in the 5th rulebook... I'll most likely buy a small force like the Battleforce box set. I love the smell of railguns in the morning!